If you're serious about your coffee addiction - go for this Italian one!. At £2 for a pack its cheaper than Tesco's own brand coffee. A strong and robust coffee evenly roasted and carefully ground to produce a coffee of exceptional flavour, body and aroma. . Rossa is the UK's leading espresso brand and Italy's No. 1 coffee. The blend of the highest quality Arabica and selected robusta coffee beans make it ideal for drinking throughout the day. Lavazza has been producing fine coffee since 1895 and is the leading Italian coffee brand, unequalled for both taste and quality. 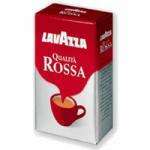 Lavazza Qualita Rossa Coffee is suitable for use in all types of coffee makers, including filters, cafetieres and espresso machines. Lavazza is the coffee brand that Wetherspoons use, just for reference. Have some heat.